When does aloha mean goodbye? Wall Street Journal readers were asked that question in a half-page advertisement from the American Sugar Alliance today. 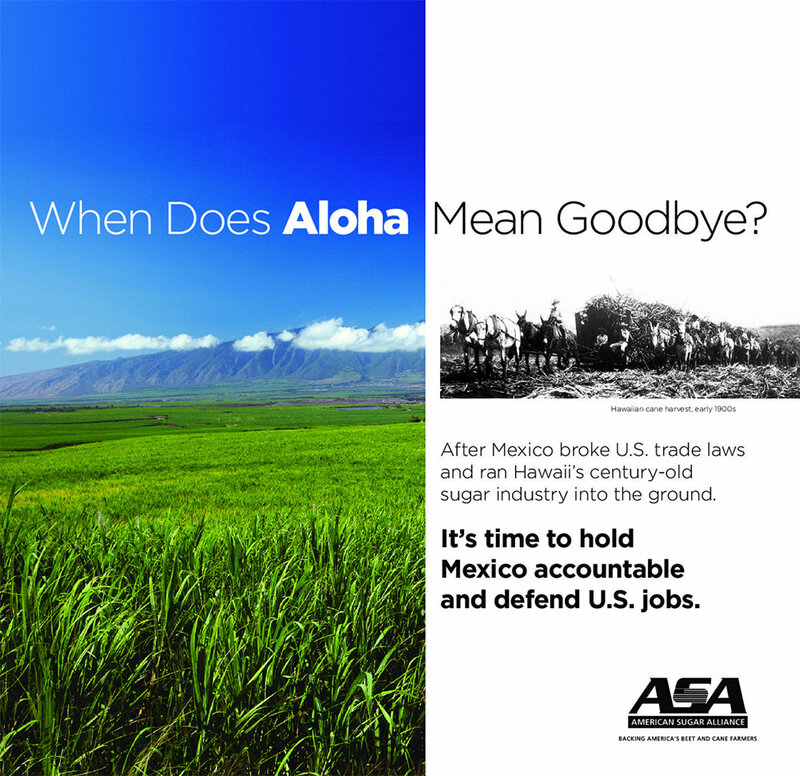 The answer: After Mexico broke U.S. trade laws and ran Hawaii’s century-old sugar industry into the ground. This print advertisement, urging America to defend its remaining sugar jobs, is just one of many running in Washington, DC, this week as U.S. government officials work to bring Mexico’s subsidized sugar industry into compliance with antidumping, countervailing duty laws. Mexico, which was found guilty in 2015 of violating those laws, is still harming U.S. sugar producers and threatening U.S. jobs by flooding the market with subsidized sugar. Mexican sugar dumping was used as a visual in several digital ads that ran in Politico, Daily Caller, The Wall Street Journal‘s Capital Journal newsletter, and elsewhere. And the message in those ads was blunt. If Mexico will not agree to comply by June 5, the U.S. Department of Commerce has promised to impose duties of 80 percent to stop the injury being done by Mexico’s unfair trade – as is required by the law.